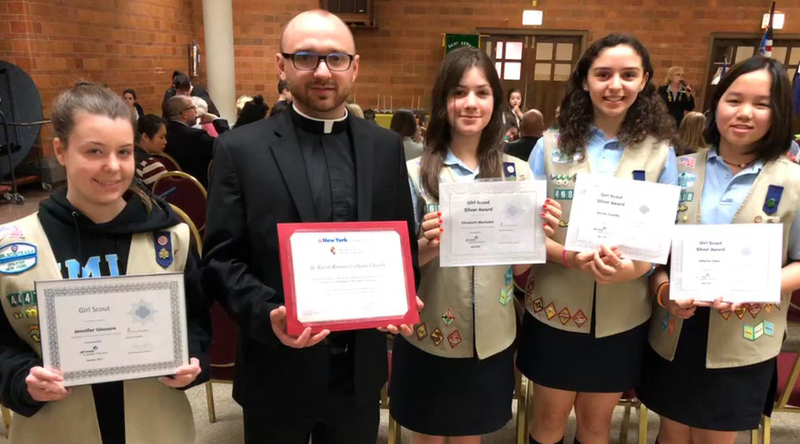 Four young ladies earned their Silver Award with the Girl Scouts at St. Kevin, Flushing. Recipients included from left to right, Jennifer Ginnane, Elizabeth Machalek, Sarah Castillo and Valerie Chan. Machalek, Castillo and Chan earned their Silver Award by hosting three blood drives at St. Kevin Church. A certificate from the NY Blood Center was presented to Father Robert Mema. Ginnane earned her Silver Award by teaching children in Vacation Bible School the principles of Catholic social teachings, fair wages and fair trade. She also raised funds for the earthquake victims in Nepal. This week’s Tip of the Tablet TALK Top Hat goes to Donna McKenzie. 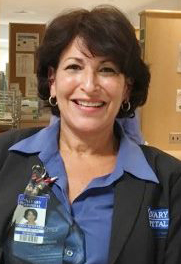 She received the Unit Secretary Excellence Award from Calvary Hospital for her exceptional service to people who come for treatment in the hospital and their families. McKenzie is a graduate of St. Edmund Prep, Sheepshead Bay. Three choruses, each including soprano, alto, tenor and bass singers will sing unaided by instruments. Martin is one of 12 soloists singing in the choruses. As a special treat, Martin commissioned 2 separate works that will be sung after the Mass. Everyone participating in the production are professional choral singers donating their time and talent for the glory of God. For tickets, go to www.eventbrite.com/e/vaughn-williams-mass-in-g-tickets-49887803764. An outdoor Rosary Rally in honor of Our Lady of Fatima, Oct. 13, 11:45 a.m. will be held in front of the Most Precious Blood, Astoria, parking lot. Immaculate Conception Church in Astoria invites you to a Life in the Spirit Seminar, Oct. 27, 8:30 a.m. – 4:30 p.m. and Oct. 28, 1-6 p.m.
St. Jerome, Flatbush, invites you to its dinner dance on Nov. 10, 8 p.m. – 1 a.m. in the school gymnasium. Tickets are $70 for adults and $45 for children 12 and under. Call 718-462-0223. Contact Tablet TALK: 718-517-3132 or azielinska@diobrook.org.